“The sweetest successes come from adventures which push us past our limits, challenge our strength and test our will. Ultimately, learning to embrace change, thriving within ambiguity, stretching and releasing myself of personal constraints, and having the determination to persevere no matter the challenge were my greatest lessons. 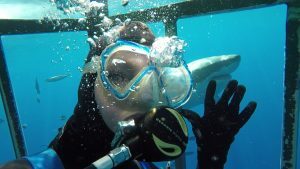 With the completion of my MBA(FS), I rewarded myself by taking the trip of a lifetime, cage diving with Great White Sharks off the coast of Guadeloupe. What a thrilling adventure, taking risks and diving into an experience filled with uncertainty! Believe it or not, I leveraged many of the skills I learned to enjoy and embrace throughout my MBA candidacy. In 2014, I resolved to take ownership over my own success and explore opportunities that would push me outside of my comfort zone. As a mother of two and a dedicated Branch Manager in the financial services sector, my decision to engage in a challenging academic journey was an affirmation and commitment to myself. I recognized that life is measured by our choices and the risks we take to realize our potential. I wanted a life filled with experiences marked by courage and purpose, rather than defined by risks avoided or sidestepped. My MBA journey provided me with lessons far beyond my expectations. Fast forward four years of balancing multiple priorities and a lot of hard work, graduation became one of the proudest moments of my life. I experienced indescribable feelings of accomplishment, confidence and assuredness, which can only be summarized as personal success! Welcoming change and fostering the determination and discipline to take responsibility for personal growth. Surprisingly, and in some ways not surprisingly at all, the ultimate learning I have experienced from achieving a MBA is that the sweetest successes come from adventures which push us past our limits, challenge our strength and test our will. Ultimately, learning to embrace change, thriving within ambiguity, stretching and releasing myself of personal constraints, and having the determination to persevere no matter the challenge were my greatest lessons. Today, and as I move forward in my career with aspirations of becoming an executive of the bank within the year and a senior executive within the next seven years (I always put a time frame on my goals), the textbook learnings, care of Dalhousie University, will guide my judgement and decisioning. Whereas the unwritten, unpublished and unmarketed soft-skill learnings will continue to drive me forward toward my dreams and full potential. My advice is to have courage to accept a challenge and reach outside of your comfort zone, for within challenge is where personal growth blooms! 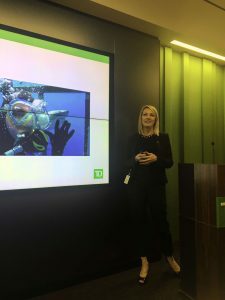 Carrie Morrison MBA(FS) leads an amazing group of colleagues who represent the North American Contact Centre in initiatives, campaigns and projects across the TD enterprise in a business leadership capacity. CEGE Connection is pleased to advise that Carrie has graciously agreed to be a repeat contributor on CEGE Connection.